The ntsysv utility provides a simple interface for activating or deactivating services. You can use ntsysv to turn an xinetd-managed service on or off. You can also use ntsysv to configure runlevels. By default, only the current runlevel is configured. To configure a different runlevel, specify one or more runlevels with the --level option. For example, the command ntsysv --level 345 configures runlevels 3, 4, and 5. 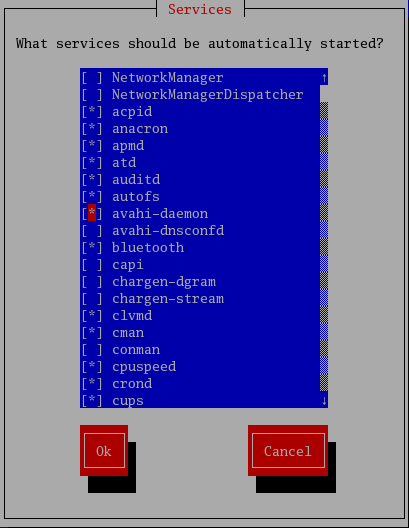 The ntsysv interface works like the text mode installation program. Use the up and down arrows to navigate up and down the list. The space bar selects/unselects services and is also used to "press" the Ok and Cancel buttons. To move between the list of services and the Ok and Cancel buttons, use the Tab key. An asterisk (*) signifies that a service is set to on. Pressing the F1 key displays a short description of the selected service. Services managed by xinetd are immediately affected by ntsysv. For all other services, changes do not take effect immediately. You must stop or start the individual service with the command service <daemon> stop (where <daemon> is the name of the service you want to stop; for example, httpd). Replace stop with start or restart to start or restart the service.